American Victorian Gone with the Wind Cranberry Hobnail Hanging Fixture -- Beautiful cranberry hobnail American Victorian Gone with the Wind fixture in beautiful original condition. The shade measures 13 1/2" in diameter x 7 1/2" tall, and the whole fixture measures 32" from top to bottom and 16" wide. 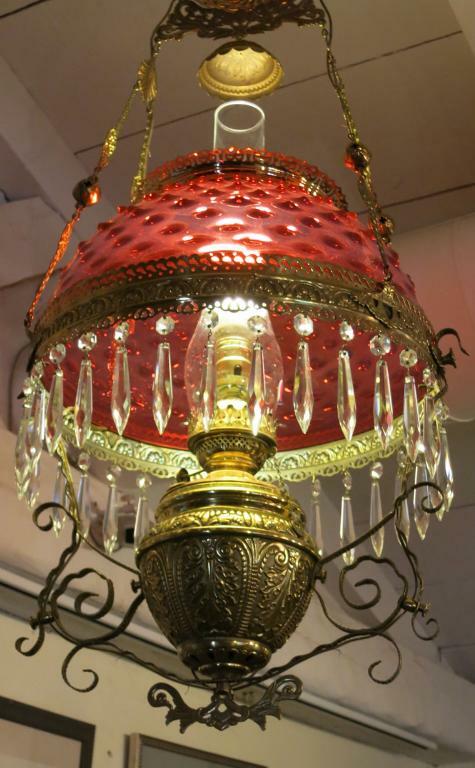 Beautiful cranberry hobnail American Victorian Gone with the Wind fixture in beautiful original condition. The shade measures 13 1/2" in diameter x 7 1/2" tall, and the whole fixture measures 32" from top to bottom and 16" wide.